This is what you get when you go to sleep at 6 while sitting on the couch. Awake at 3 and finally at 3:30 decided I might as well get out of bed. I really did try to stay awake last night but had been up the night before because I was ill and I was just worn out, so it goes. Yesterday was a productive day in the kitchen at least. I made a rum cake and the most wonderful carmel corn I've ever done. I'm having a really hard time not eating the whole batch. That rounds up the last of the Christmas baking and candy making unless Anah really does decide to make fudge. I hope she does because I really like fudge. Though I'm thinking I don't need anything else around here to tempt to my sweet tooth. 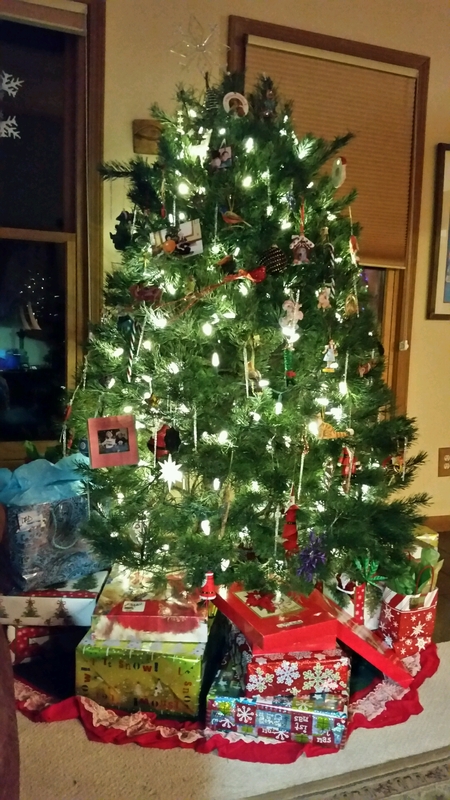 The presents are wrapped and under the tree which makes it look much more festive and keeps the cats from rolling around and knocking the ornaments off. With temperatures in the 50s it doesn't seem much like Christmas at all. I really do prefer some snow, but doesn't look like we're going to get that this year. Soon it will be time for my tea and toast which is really my favorite time of the morning so I'm looking forward to that. Until then I'm sure I can kill sometime either reading or on one of my electronic devices. Being up this early will probably make me sleepy again at about 6. I'd rather get back into a different sleep pattern but not sure how to do that. Wow, your tree is stuffed and Santa hasn't even come yet! I hope that you are able to get your sleep readjusted. I think I'm the only one left who believes in Santa. Hope to stay up later tonight, but at least at 3 am I get some great alone time. Not the only one. I still do with my heart and soul. Those are the parts that count. Found it on Pinterest, where else? I think I like it so much because it's salted caramel and I do love me some salt especially when it's mixed with sweet. Not surprising at all. I've found some great stuff there.